6 models available, from 20 bar to 500 bar. Chose a pump with a working pressure higher than one and a half times the test pressure. HEP0500DCRmodel, without tank and on trolley. Supplied with pressure gauge and control valve. HEP0180 pump supplied with double control valve. 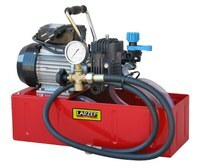 All pumps, except HEP0180 model, are supplied with 1.5 metre hose. Ensure that all accessories are suitable for the maximum working pressure. Pressure gauge: Dual scale bar / psi. Class 1.6. Electric pump for filling, pouring, pressurizing and testing water systems and other non-oily liquids, such as antifreeze fluids. Working pressure: 20 bar. It can be connected directly to the water mains or tank. Maximum suction height 3 metres. Body of the pump made of anodized aluminium. 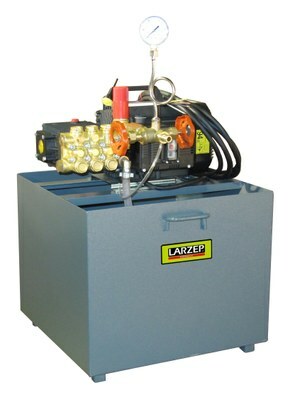 Supplied with 1.5 metres hose, pressure gauge ø60 and control valve. Electric pump for filling, pouring, pressurizing and testing water systems and other non-oily liquids, such as antifreeze fluids. Working pressure: 50 bar. Supplied without tank. To be connected directly to the water mains. Lightweight and strong construction. Manufactured in anticorrosive and wear and tear resistant materials. Supplied with 1.5 metres hose, pressure gauge and control valve. Electric pump with 100 litres tank used for filling and testing hydraulic systems in industrial plants. Working pressure: 120, 150 y 250 bar. HEP0120 and HEP0250 models are supplied with 1.5 metres hose, pressure gauge and control valve. HEP0180 model is supplied with pressure gauge and double control valve. Hose is not supplied as standard. Supplied with a second manometer to regulate the pressure before filling the system. Electric pump designed for filling, pressurizing and testing hydraulic and steam systems, in chemical, electric, pharmaceutical industry. Working pressure: 500 bar. During testing the pump can be physically disconnected from the circuit. Mounted on trolley with wheels, and hooks for lifting the pump with straps. Control panel with authomatic thermic protection and emergency stop button. Pressure can be set before the test, to avoid overpressure on the system.